Posted On Fri, 10 Apr 2009 23:49:00 +0000. Filed in onstartups. By Vaibhav Bhandari. WiseVoter is a free demopedia where people can collaboratively keep track of politicians. Most of the data associated with a politican’s profile can be edited via a form (look for “edit with form”) link. The data comprises elements like Networth, Criminal Record, Education etc. This enable to write a lot of analytical tools which give you various facts about your politicians. How is WiseVoter different? 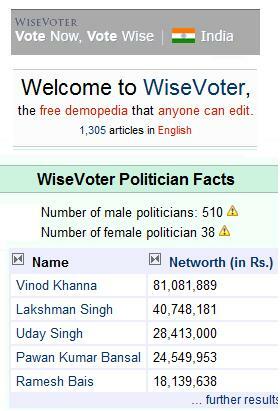 Currently WiseVoter has the most comprehensive data of politicians contesting in the Indian Lok Sabha elections 2009. The data is spidered using Lok Sabha, Rajya Sabha websites, NoCriminal.org and various internet resource. Other wesbites don’t have this comprehensive data, and we aim to keep adding new data each day. However what sets us apart is that we are allowing this data to be editable by any one, in Wikipedia style. We aim to be around and serve this database for more than one election, unlike most other websites. WiseVoter is of the people, by the people and for the people in every true sense! Why Now? This release of WiseVoter is targeting India Lok Sabha 2009 elections. A profile of a politician can be marked with appropriate candidature field and this information could be used by State or City elections as well! Add more politicians to the demopedia! - Its simple just click add politician in left column and fill the forms. Keep information of the current politician up to date. Just click on the “edit with form” link on top of each profile and change any discrepancies you see! Give us feedback and discuss the information on the website using the bottom bar! !